This is the second installment of what I thought would be a two-part look at the museums in the Ozark Gateway region. After gathering information about the museums located in state parks, I realized that what was really needed was a three-part series, with Part III focusing exclusively on the state park museums. Part II visits museums in Sharp, Lawrence, and Randolph counties. As I said in Part I, I hope that these articles will encourage you to visit the museum in your community with your entire family. Pocahontas in Randolph County is home to two fascinating and popular museums, The Eddie Mae Herron Museum Center at 1708 Archer Street and the Randolph County Heritage Museum at 116 E. Everett Street. Randolph County can also boast a third museum, the Maynard Pioneer Museum, located on State Highway 328 on the outskirts of the town of Maynard. The school was eventually restored as a cultural, education, and community center. The complete, inspiring history of the building and Miss Eddie Mae can be found on the center’s impressive and comprehensive website, www.HerronCenter.org. The center preserves and displays a portion of the nearly two hundred years of African-American history in the region. It proudly proclaims its mission: “Helping individuals, communities, and organizations to identify, protect, and preserve the history of, and to foster widespread appreciation of and respect for, African American culture.” The center achieves its mission with exhibits, demonstrations, guest speakers, concerts, book signings, and ongoing education. It celebrates Black History Month every February with a variety of activities, including lectures on historic topics and demonstrations of soap making, hog butchering, sausage making, and quilt making. Weekly traditional quilt making demonstrations are also offered. Juneteenth, observed every year on July 19, originally celebrated African-American Emancipation. Today, the center celebrates the holiday as a landmark of African-American freedom and emphasizes education, achievement, and community. The Eddie Mae Herron Center is open Monday through Friday from 10:00 a.m. to 3:00 p.m. and Saturdays from 9:00 a.m. to noon. The Randolph County Heritage Museum, established in 2006, is a subsidiary of Five Rivers Historic Preservation. The museum features exhibits from northeast Arkansas’ rich heritage that spans over two centuries. Among the featured subjects are textiles, business, medicine, law enforcement, early education, agriculture, and the county’s five rivers. Among the dozens of interesting items are the gravestone of Ransom (aka Ranson) Bettes, the founder of Pocahontas; and a locally manufactured 1880’s jug decorated with buttons by Mrs. Dennis W. (Mattie) Reynolds, wife of the founder of the town of Reyno. The Museum’s River Room proudly displays a mounted, record setting alligator gar caught at Shaver’s Eddy on the Black River near Biggers in the 1950’s. It also displays artifacts and fresh water pearls from the Great Pearl Rush of the early 1900’s. The museum is open Monday, Wednesday, and Friday from 10:00 a.m. to 4:00 p.m., Tuesday and Thursday from 9:00 a.m. to 4:30 p.m., and Saturday from 10:00 a.m. to 1:00 p.m. Admission is free. For information call 870-892-4056 or visit www.RandolphCoMuseum.org. The online gift shop can be accessed via the website. Maynard’s Pioneer Park is built around a nineteenth-century log cabin relocated from nearby and restored to represent an 1800’s rural family home, complete with period furnishings, textiles, and household implements that would have been found in a typical Ozark foothills farmstead or home. The park includes the Pioneer Museum, with exhibits dating from the mid 1800’s and an historic jail dating back to the 1930’s. Among the items in the museum are antique furniture, kitchen utensils, glassware, linens, photographs, and farm tools and machinery. The collection also includes two locally made coffins dating back to the early 1900’s and paraphernalia from a local doctor. The park features walking trails, herb and flower gardens. The park also hosts the annual Maynard Pioneer Days every September with gospel, country, and bluegrass music. For information visit http://www.seerandolphcounty.com/towns/maynard.php. The Good Old Days Vintage Motorcar Museum, in downtown Hardy at 301 West Main Street, displays over 60 vintage transportation vehicles, from a 1908 Sears Runabout to a 1981 DeLorean. There are also a number of flivvers and tin lizzies to appreciate, a 1958 BMW Isetta, and an extremely rare Bowden Spacelander, a futuristic art-deco all-fiberglass vehicle from the 20’s. The gift shop contains hundreds of items. Open Monday through Saturday. Group rates are available. For information call 870-856-4884 or email vintagemotorcarmuseum@tenn-plast,com. The Walnut Ridge Army Flying School Museum, better known as the Wings of Honor Museum, was in 1999 to preserve the rich history of the Walnut Ridge Army Flying School; the Marine Corps Air Facility at Walnut Ridge; the War Assets Administration’s Warbird Storage, Sales and Scrapping Facility; and the USAF 725th Radar Squadron; and to remember and honor those civilian and military who served to preserve our freedom during WWII. The “wings” refer to “the wings they wore and the wings that carried them to victory. The museum is still in a growth stage; a number of gallery exhibits are under construction, including “Accident Scenes,” “Around the Field,” and “After the War.” Even though work is going on, the museum is still well worth a visit. 870-886-2481, visit www.wingsofhonor.org, or email harold@bscn.com. The Walnut Ridge Airport is also home to the Parachute Inn, a restaurant in the fuselage of a Southwest Airline Boeing 737, is a museum of sorts. The inside of the aircraft has been painstakingly refurbished to capture the Southwest Airline “look” and to give diners ample space. The unique and comfortable dining room is connected to the main building by a walkway that replicates the boarding experience. The Parachute Inn has been “adopted” by Southwest pilots whose signatures and messages adorn the areas above the seats. The restaurant is open Tuesday through Friday from 7:00 a.m. to 2:00 p.m. for breakfast and lunch and Friday and Saturday from 5:00 p.m. to 8:00 p.m. For a review of the Parachute Inn, go to www.ozarkgateway.com and click on “Restaurant Reviews” on the right side of the page; then scroll down to the Parachute Inn review. 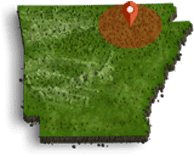 For additional information about the Ozark Gateway region, including restaurant reviews, visit www.ozarkgateway.com, call 800-264-0316, or pick up our free annual tourist guide magazine, available at stores, restaurants, hotels, gas stations, museums, state parks, and visitor’s centers. Travel safely and look for Part III soon.